A short posting today. The season comes in like a lion! It's very bright and windy here at the North Carolina coast and there's even a gale blowing. The two local rivers, the Neuse and the New River, have white-caps today. No one in their right mind is fishing! The Easter Bunny/Kitty pictured here is a Web-pic from a fairly obscure site where someone's cat named Sammy has his own gallery. The black-n-white fur color is right. One night coming home the evening of Saturday, Easter eve, a large black-n-white lop-earred rabbit hopped out from the bushes beside the garage. So now I'm positive that I do know what the Easter Bunny really looks like! The quilt, on the other hand, is an unusual antique Amish quilt from the state of Illinois. In the picture, the quilt looks pinker than its true-to-life version, seen in the excellent book Illinois Amish Quilts by Jan Wass. This Log Cabin pattern, with a piano keys border, is a crib quilt made from wools and cotton sateens. Dating from the 1890s, its probable maker was Lydia Yoder Diener. I admire the Illinois Amish quilts. They have a special earthiness and often display subtle and unusual color combinations. Long after most 19th century American quilters were working completely with cottons, these folks continued to use wools, probably because there were three woolen mills in the Arthur, Illinois area. When the quilts from this book were exhibited at the International Quilt Festival in Houston, TX, I went back time after time to look at them. 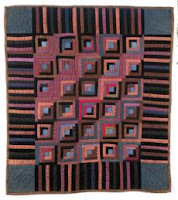 They are everything I love about old quilts: creative, individualistic to the point of being quirky, beautiful, and bold. The Quilters Guild of the British Isles has sent out a press release that its new museum is almost up and running. Any chance you're planning a trip to England this summer? Every quilt nut going to Merry Olde now has another 'must see' spot! The new facility is in a historic building in the city of York, a city you won't want to miss anyway with its gorgeous cathedrals. 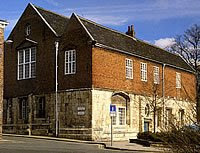 From the Guild's February 6 press release: Europe's only museum dedicated to quilting and textile arts opens its new facility on 7 June 2008, in historic Yorks medieval St Anthonys Hall. The Quilt Museum and Gallery will become the national headquarters of the Quilters' Guild of the British Isles and its world-famous Heritage Collection. 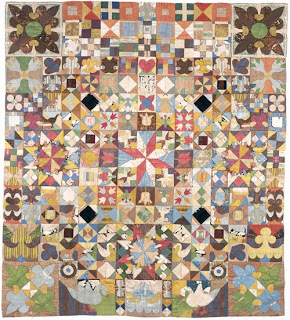 The earliest known signed and dated patchwork, the colourful 1718 patchwork coverlet, is among some 600 quilts in the Guild's Heritage Collection etc. Below is a photo of what the 1718 coverlet. Like many early English pieces, it was sewn in the over-paper template manner. Isn't it exquisite? Congratulations to the UK Quilt Guild and I'll be campaigning for an English vacation in the near future. May 2009 is what I'm aiming for. I love England in May!